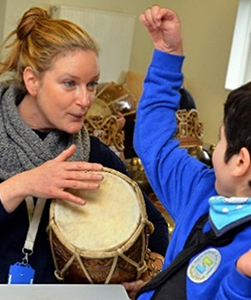 Our Soundtracks projects are led by freelance musicians who have an enormous amount of experience in working with children who have additional needs. Assisting them are young musicians who are at an earlier stage in their careers, but who have typically completed postgraduate study in community music. Our ‘bank’ of musicians growing steadily; meet a few of them here. Mark has worked with Jessie’s Fund since the early days of the charity. 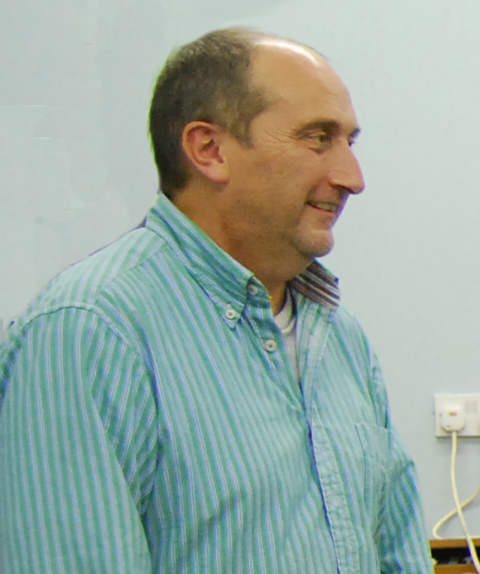 He leads training work for hospice and special school staff and is involved in the charity’s work in hospitals as well as the Soundtracks programme. 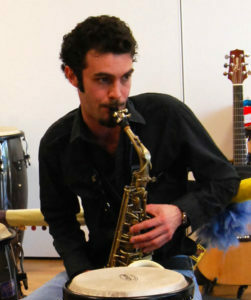 Away from Jessie’s Fund, Mark works both as a clarinettist and as a leader of creative projects. He collaborates regularly with the London Symphony Orchestra, Orchestra of the Age of Enlightenment and the Orchestre de Chambre de Paris. Since 2010, Mark has been associated with the Aix-en-Provence Festival for whom he has designed numerous pieces, including Ouvertures, the opening event of the 2016 Festival. Eve is a composer and trumpet player. She studied at the University of Manchester and Royal Northern College of Music. During London Sinfonietta’s Blue Touch Paper, she explored engagement with new music via smartphones. New works inspired by local memories are installed at North City Library, Manchester. She has written works for Opera North Youth Company, Scottish Ensemble, Ebor Singers, Durham Brass Festival, National Youth Orchestra of Scotland, beatboxer Jason Singh and a chamber opera, Hera’s List, which was performed at Tête à Tête Festival. 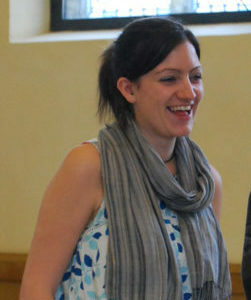 Eve leads education projects for many arts organisations in the North of England and loves working for Jessie’s Fund. She co-directs Sounds of the Engine House and plays trumpet with Balkan band The Rubber Duck Orchestra. 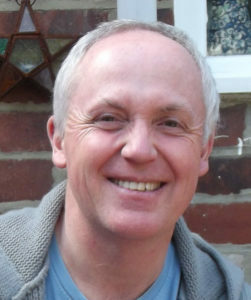 Andy works regularly with Jessie’s Fund and enjoys a varied career working in many different musical worlds. As a double bass player, he has played with many of the leading orchestras in this country. He was for many years the ‘Community Musician’ for the Bournemouth Symphony Orchestra, leading projects in schools and communities – his work with inmates of the Verne Prison in Dorset was nominated for a prestigious Royal Philharmonic Society Award. 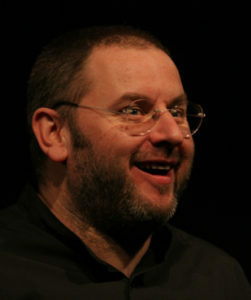 More recently he has created a Community orchestra specifically for people with dementia and their carers. His best Jessie’s Fund moment? Working in a Respite Centre in Exeter when a young lad suddenly started singing (and playing his tambourine) passionately in a version of ‘Uptown Funk’! Tom is a musician, music leader, trainer and composer. Tom has extensive experience working with vulnerable people in many settings, including special schools, healthcare environments, prisons, secure units and in the community. Having graduated from Leeds College of Music with a BA in Jazz Studies, improvisation and play are a big part of Tom’s work. He has delivered numerous five day soundtracks projects for Jessie’s Fund, as well as delivering year long projects with a staff training focus. Tom works for a number of different charities and organisations delivering music projects, including as a mentor for Live Music Now. Hannah is a professional clarinettist and multi-instrumentalist, whose diverse performing career includes orchestral freelancing with Manchester Camerata, touring with Giffords Circus, performing and recording with bands including BBC Folk Award winners The Unthanks and headlining stages at festivals including WOMAD and Boomtown Fair with her Manchester-based Balkan Band ‘The Rubber Duck Orchestra’. Creativity lies at the heart of her music making. Following her training as a musician in hospitals, Hannah enjoys delivering projects for organisations such as Manchester Camerata, Clonter Opera, Opera North, and Manchester’s Royal Exchange Theatre. 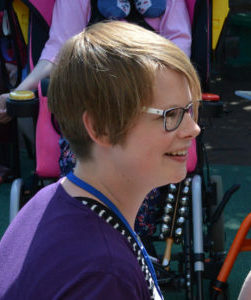 She is hugely passionate about her role as lead musician with Jessie’s Fund and the opportunity this gives her to work with special schools throughout the UK. Joe Harrison-Greaves is a musician and education consultant who has worked in music education for over a decade as a musical director, facilitator and project manager with organisations such as the BBC, The Guildhall School of Music, Curious Minds and Brighter Sound. 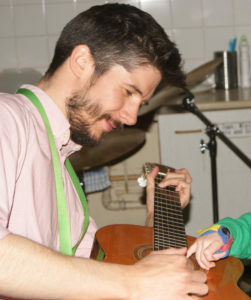 Over the last 4 years he has specialised in working in special needs settings and approaches to developing a whole school culture of music. Joe has also performed around the UK in a wide variety of bands over many years, and is also a co-founder of the Slow Education movement.